内容简介：一、《中国环境统计年鉴-2017》是国家统计局和环境保护部及其他有关部委共同编辑完成的一本反映我国环境各领域基本情况的年度综合统计资料。本书收录了2016年全国各省、自治区、直辖市环境各领域的基本数据和主要年份的全国主要环境统计数据。 二、本书内容共分为十二个部分,即:1.自然状况;2.水环境;3.海洋环境;4.大气环境;5.固体废物;6.自然生态;7.土地利用;8.林业;9.自然灾害及突发事件;10.环境投资;11.城市环境;12.农村环境。同时附录五个部分:人口资源环境主要统计指标、“十三五”时期资源环境指标、东中西部地区主要环境指标、世界主要国家和地区环境统计指标、主要统计指标解释。 三、由于环境统计方法体系发生调整,环境保护部2016年环境统计数据延迟发布,拟与2017年环境统计数据同时发布。 四、本书中所涉及的全国性统计指标,除国土面积和森林资源数据外,均未包括香港特别行政区、澳门特别行政区和台湾省数据;取自国家林业局的数据中,大兴安岭由国家林业局直属管理,与各省、自治区、直辖市并列,数据与其他省没有重复。 五、有关符号说明: “空格”表示该项统计指标数据不详或无该项数据; “#”表示是其中的主要项。 六、参与本书编辑的单位还有水利部、住房和城乡建设部、国土资源部、农业部、国家卫生和计划生育委员会、民政部、交通运输部、国家林业局、国家海洋局、中国气象局、中国地震局。对上述单位有关人员在本书编辑过程中给予的大力支持与合作,表示衷心的感谢。 Ⅰ.China Statistical Yearbook on Environment-2017 is prepared jointly by the National Bureau of Statistics,Ministry of Environmental Protection and other ministries.It is an annual statistics publication,with comprehensive data in 2016 and selected data series in major years at national level and at provincial level(province,autonomous region,and municipality directly under the central government) and therefore reflecting various aspects of China's environmental development. 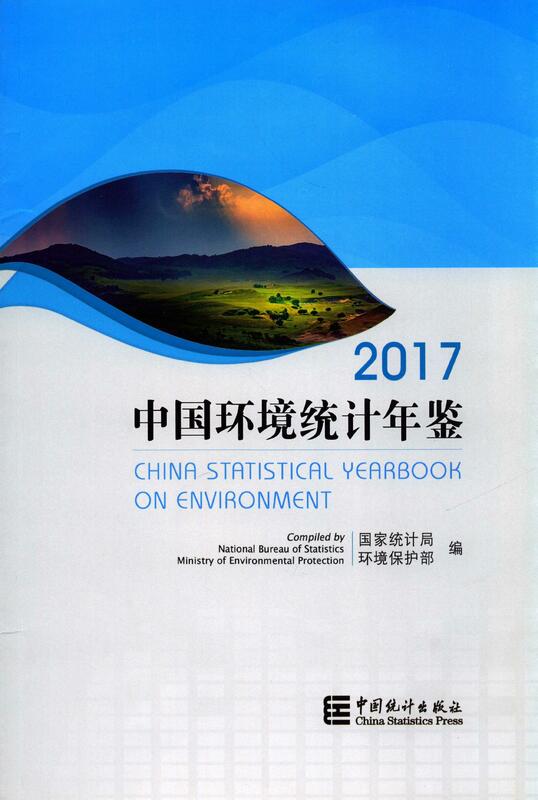 Ⅱ.China Statistical Yearbook on Environment-2017 contains 12 chapters:1.Natural Conditions;2.Freshwater Environment;3.Marine Environment;4.Atmospheric Environment;5.Solid Wastes;6.Natural Ecology;7.Land Use;8.Forestry;9.Natural Disasters & Environmental Accidents;10.Environmental Investment;11.Urban Environment;12.Rural Environment.Five appendixes listed as Main Indicators of Population,Resource and Environment;Main Resources & Environmental Indicators in the 13~(th) Five-year Plan;Main Environmental Indicators by Eastern,Central and Western;Main Environmental Indicators of the World's Major Countries and Regions;Explanatory Notes on Main Statistical Indicators. Ⅲ.Due to the adjustment of the environmental statistical methodology,the Ministry of Environmental Protection has delayed releasing the environmental statistics of 2016,which is scheduled to be released simultaneously with that of 2017. Ⅳ.The national data in this book do not include that of Hong Kong Special Administrative Region,Macao Special Administrative Region and Taiwan Province except for territory and forest resources.The information gathered from the State Forestry Administration.Daxinganling is affiliated to the State Forestry Administration,tied with the provinces,autonomous regions,municipalities under the central government,without duplication of data. Ⅴ.Notations used in this book: "(blank)"indicates that the data are not available; "#"indicates the major items of the total. Ⅵ.The institutions participating in the compilation of this publication include:Ministry of Water Resource,Ministry of Housing and Urban-Rural Development,Ministry of Land and Resource,Ministry of Agriculture,National Health and Family Planning Commission,Ministry of Civil Affairs,Ministry of Transport,State Forestry Administration,State Oceanic Administration,China Meteorological Administration,China Earthquake Administration.We would like to express our gratitude to these institutions for their cooperation and support in preparing this publication.